Transportation in South Korea refers to all modes of transportation that have been developed in South Korea from before the Japanese colonization of Korea in 1905 until the present day. That comprises railroads including the bullet train and defunct street cars, subways, automobile and highways, ships including ferries, and airlines both domestic and international. In the late 1800s, officials in the Joseon court split on whether to adopt western transportation technology, as Japan had, or to reject it. Japan, partly due to the advantages gained by adopted Western technology, annexed Korea in 1905 and carried out a forced technology development, laying railroad tracks and bringing trains and stationing steam powered ships in Korean ports. After the Korean War, especially after the 1960s, South Korea began to develop an extensive networks of railways, highways, bus routes, ferry services, and air routes that criss-cross South Korea. Today South Korea's transportation system is modern, effective, and affordable for most South Koreans. South Korea's railroad network links the entire country. The first railroad linking Seoul and Inch'on opened September 1899. The Japanese constructed other major lines during the colonial period, including Mokpo, Masan, and Busan lines. They connected to Seoul and Sinuiju in North Korea linking with the Trans-Siberian Railway. The Korean War badly damaged the railroad network, which the South Korean government rebuilt and improved. The establishment of the DMZ severed railroad lines between North and South Korea. Throughout the 1970s and 1980s, the Korean National Railroad, a state-run corporation under the Ministry of Transportation, managed all rails, electrifying heavily used tracks and laying additional tracks. Railroads in the 1980s primarily transported freight, but they also carried significant passenger traffic around Seoul and in the heavily-traveled corridor linking the capital with the southern port of Pusan. Although the railroad system grew little during the 1980s (with 5,600 kilometers of tracks in 1980), rail improvements—the increased electrification of tracks, replacement of older tracks, and the addition of rolling stock—allowed rail traffic to boom. Some of the busiest lines south of Seoul linking the capital with Pusan and Mokpo had three or four tracks. The 1980s also saw the introduction of high-speed trains connecting Seoul with Busan, Jeonju, Mokpo, and Gyeongju. The famous "Blue Train" (Saemaul-ho) between Seoul and Busan (via Daejeon and Daegu) took only 4 hours and 50 minutes and offered two classes of service, first class and special. In 1987, approximately 525 million passengers and 59.28 million metric tons were transported by the railroad system. In 1987, the combined length of the country's railroad network measured approximately 6,340 kilometers, including approximately 761.8 kilometers of doubletrack railroads and 1,023 kilometers of electric railroads. Electrified Suburban lines connected to the Seoul subway system. Rolling stock included 459 diesel locomotives, 90 electric locomotives, 133 motor coaches, and 370 electric motor cars. In 1989, the Ministry of Transportation and Construction opened negotiations for the construction of a high-speed railway systems similar to those in Japan and France. The Korail is the sole passenger railway operator. Total railroad passengers in South Korea have decreased since 1990s. Despite continuous road construction, railways still constitute one of the primary means South Koreans travel over long distances within the country. In 2002, KNR maintained 3,124 km (1,941 mi) of track, increasing to 3,472 km (1,361 km electrified) in 2005. The high-speed railway known as Korea Train Express (KTX) currently operates between Seoul and Busan or Mokpo. The railway uses French TGV technology. Service started in April 2004—with some sections operating along preexisting track—while service on the railway's fully separated tracks will begin in 2010. Trains reach a maximum speed of 300 km/h on dedicated high-speed tracks. South Korean KTX engineers established HSR-350x independently, making South Korea one of the top four High-speed train producing nations in the world. In 2007-2008, HSR-350x will provide service on Honam Line. High-speed trains operate on normal tracks as well, including a tilting train called TTX (Tilting Train eXpress). Announcement of TTX service beginning on the Gyeongbu and Honam line, using an ATP safety system, is expected in 2008. Until the division of Korea following the end of the Second World War, the Gyeongi Line and Gyeongwon Line extended into North Korea. The Gyeongi Line connected Seoul to Kaesŏng, P'yŏngyang, and Shinŭiju on the Chinese border, while the Gyeongwon Line served Wŏnsan on the east coast. Another line, the Kŭmgang-san Line, connected the Southern city of Cheorwon on the Gyeongwon Line to Mt. Kŭmgang in the North. The North and South Korean governments are reconnecting Gyeongui Line and the Donghae Bukbu Line south and north halves. On May 17, 2007 two test trains ran on the reinstalled lines; one on the west from Munsan to Kaesong; the second on the east from Jejin to Kumgang. Tonghae Station, the last station of Jinhae Line. A'REX 인천국제공항철도 Gimpo Airport, Incheon Airport Airport Express Co. 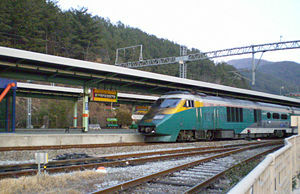 Most routes enjoy frequent service, with trains every 15-60 minutes connecting Seoul to all major South Korean cities. Four classes of train operate: KTX, the Korean high-speed railway system, travels from downtown Seoul to downtown Busan faster than an airplane, makes less stops and yet costs more; the Saemaul-ho (새마을호, "New Village") service, makes the fewest stops and provides the most comfortable seating; Mugunghwa-ho (무궁화호, "Rose of Sharon") service, popular with most Koreans, stops at most stations, and offers a mixture of reserved and unreserved seating; and Commuter (통근 열차) service, the slowest and cheapest of the three, stops at all stops, and offers no reserved seating. Seoul's subway system is the oldest system in the country, with the Seoul Station-Cheongnyangni section of Line 1 opening in 1974. In 2007, eight lines extend 178 miles with 263 substations, transporting 5.6 million passengers a day. Line 9 in Seoul is in building phase 3. Busan, Daegu, Gwangju, Daejeon and Incheon, South Korea's five next largest cities], all have subway systems. Busan's two lines traverse 55 miles with 93 stops, carrying 706,000 passengers a day; a third line is in phase 3 construction. Daegu's 2 lines extend a total of 35.8 miles with 56 substations. Incheon's subway system covers 15.3 miles with 22 stations. Gwangju's one line runs 7 miles with 12 stops. Korean's choose the subway over automobile because of convenience and avoiding traffic jams. Streetcars operated in Seoul from the turn of the twentieth century until roughly 1970. The network covered the whole downtown area (Junggu and Jongnogu) as well as surrounding neighbourhoods, including Cheongnyangni in the east, Mapogu in the west, and Noryangjin across the Han River to the south. The network was largely replaced by the subway system whose construction began in the early 1970s. Lines 1 and 2 follow the old streetcar routes along Jongno and Euljiro respectively. Regional bus service serves virtually every town in South Korea regardless of size. They have been classified as Gosok bus ("high speed" express bus) or Shioe bus (pronounced "shee-way": literally, "suburban" intercity bus) with Gosok buses operating over the longer distances and making the fewest (if any) stops en route. Shioe buses typically operate over shorter distances, cover the route slower, and make more stops. The expansion and rapid improvement of South Korea's long-distance highway system led to the growth of an intercity bus system in the 1980s. In 1988, ten express bus companies operated a fleet of approximately 900 buses connecting all of the major cities of Korea. Within cities and towns, two types of city bus operate in general: Jwaseok ("coach") and Doshihyeong or Ipseok ("city type" or "standing"). Both types of bus often serve the same routes, make the same(or less) stops, and operate on similar frequencies, but Jwaseok buses are more expensive, offer comfortable seating; while Doshihyeong buses are cheaper, have fewer and less comfortable seats. Many small city and towns lack Jwaseok buses, their buses officially called Nongeochon Bus ("bus of rural area"). Some cities have their own bus classifying system. An extensive network of comfortable, high-speed buses serves from all parts of the country serve Incheon International Airport. The government passed regulations prohibiting many department stores of maintaining their own small network of buses for shoppers. Most churches and daycares still send buses around to pick up their congregants or pupils. Roads and expressways rapidly expanded during the late 1980s, before and after the 1988 Olympics. Although the total kilometers of roads rapidly increased, the construction failed to keep pace with the flood of cars and trucks on Korean roadways. In 1988, Korea had 51,000 kilometers of roadways, less than half unpaved. Express highways between major cities measured 1,539 kilometers in 1988, compared to 86.8 kilometers in 1967. With few cars and trucks on the roads in the 1960s, traffic congestion never happened. That changed with the explosive sale of Korean made automobiles in the late 1980s. In 1989, the government started construction on nine new expressways with a combined length of 1,243 kilometers. In 1996, when those expressways and two additional projects completed, South Korea had twenty-one expressways with a combined length of 2,840 kilometers. Motor vehicle registration in Korea increased dramatically from 527,729 in 1980 to 15,493,681 in 2006. Korean automakers Hyundai, Kia, and Daewoo sought to build their sales through the domestic market while the government restricted the importation of cars from abroad. That, coupled with a dramatic increase in GNP as well as person income, Korean bought cars with abandon. Automobiles increased between 1980 and 2006 at a rate of fourteen percent a year. Passenger cars experienced the largest increase from 249,102 to 11,224,016, more than 45 times. As of Feb. 2006, the Korean government registered 1,113,935 passenger/cargo vehicles, 3,107,729 trucks, and 48,001 special vehicles. The Korean government classifies highways in South Korea as freeways (expressways/motorways), national highways, and various classifications below the national level. All freeways charge tolls, and the Korea Highway Corporation operates freeways except Route 130. The freeway network serves all parts of South Korea. The Highway Corporation operates service stops with dining facilities en route. Effective cut off from the Asian mainland by North Korea, South Korea has turned toward shipping as the primary way of moving products. South Korea has become one of the world's largest shipbuilding industries, operating an extensive system of ferry services as well. As one of the world's most advanced IT technology exporters, South Korea operates one of the largest merchant fleets that sail regularly to China, Japan, and the Middle East. Large conglomerates like Samsung operate most fleets while small, private operators run most ferries. Small islands, served by ferries, dot the south and west coasts of the country. Ferries serve the larger offshore Jeju and Ulleung Islands as well. Ferries also operate between South Korea, China, and Japan. Major centers for ferry service include Incheon, Mokpo, Pohang, and Busan. Jinhae, Incheon, Gunsan, Masan, Mokpo, Pohang, Busan, Donghae, Ulsan, Yeosu, Jeju serve as Korea's major ports for international shipping and foreign flagged ocean liners. Container ships aboard Korea-flagged ships traverse the world's oceans to South and North America, Europe, Australia, the Middle East, and Africa. In 2003, Korean ports handled approximately 596 tons of cargo, compared with 9 million tons in 1961. In 1999, Korea's Merchant Marine fleet numbered 461 ships (1,000 GRT or over) totaling 5,093,620 GRT/8,100,634 DWT. The types of ships broke down as follows: bulk 98, cargo 149, chemical tanker 39, combination bulk 4, container 53, liquefied gas 13, multi-functional large load carrier 1, passenger 3, petroleum tanker 61, refrigerated cargo 26, roll-on/roll-off 4, specialized tanker 4, vehicle carrier 6. In 1996 the South Korean government upgraded the department of Korea Maritime and Port Administration to the Ministry of Maritime Affairs and Fisheries indicated the increased importance placed upon the Merchant Marine enterprise. Although most Koreans travel between cities by express bus or train, air service between major cities increased, especially among business travelers. Korean Air, founded by the government in 1962 and privately owned since 1969, served as South Korea's sole airline until 1988. Korean Air serves major domestic routes, offering international service to Japan, the United States, Canada, West Germany, France, Hong Kong, Iraq, Libya, Malaysia, the Philippines, Saudi Arabia, Singapore, Switzerland, Taiwan, Thailand, and the United Arab Emirates. A second carrier, Asiana Airlines, established in 1988, served three domestic cities. To accommodate the rapidly growing number of air travelers, Incheon International Airport (serving Seoul) opened in 2000. The two airlines combined offered 1,700 flights a week internationally in 2004, maintaining a combined fleet of over 180 passenger and cargo aircraft. By the beginning of 2004, they served 95 cities, ranking fifth in the world for total cargo carried and twelfth in the world to total number of passengers. 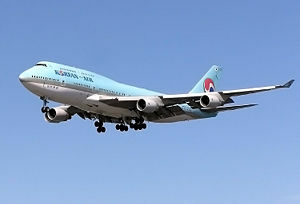 Domestically, Korean Air and Asiana serve 14 cities, transporting 21.3 million passengers in 2003.
International airports at Gimpo (serving Seoul), Gimhae (serving Busan), Jeju, Cheongju, and Yangyang. The Korean government has launched the construction of several international/domestic airports. As mentioned above, two international airlines serve South Korea: Korean Air and Asiana Airlines Both provide frequent domestic service and operate extensive international networks. Two small domestic airlines, (Hansung Airlines and Jeju Air), offer low cost fares on their routes. Two airports serve Seoul: Incheon International Airport and Gimpo International Airport (formerly Kimpo International Airport) Incheon hosts most international routes while Gimpo services mainly domestic flights. Busan and Jeju bring the total of Korea's major airports to four. Incheon International Airport opened March 2001 offering state-of-the-art facilities for international passengers. Located between Seoul and Incheon, the airport serves more than half the people living in Korea. Planned and constructed as a major air hub for East Asia, the Korean government plans to establish a Free Trade Zone, International Business District, and Special Economic Zone. In 1999, Korea had 103 airports small and large, with paved runways from 3,047 meters to under 914 meters. Airports with unpaved runways numbered 36 measuring from 3,047 meters to under 914 meters. Heliports number 203. ↑ (en), Korea Railroad, 2007. ↑ "Korean trains in historic link-up", BBC News. Retrieved May 17, 2007. ↑ For lines under construction or planned, see Jungbunaeryuk Line and Gangwon Line. No railway service exits on Jeju Island. ↑ Transportation, Korea.net. Retrieved April 10, 2008. ↑ Korean Air, Korean Air. Retrieved April 10, 2008. ↑ Asiana Airlines, Asiana Airlines. Retrieved April 10, 2008. ↑ (Website), Incheon International Airport Corp. Retrieved April 10, 2008. All links retrieved August 3, 2015. Nation Master.com: South Korea; Transportation. History of "Transportation in South Korea"
This page was last modified on 3 August 2015, at 21:01.